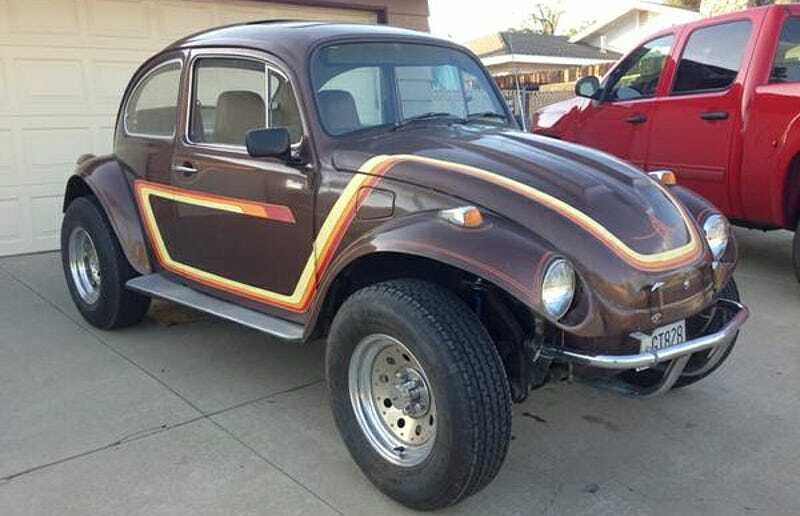 Today’s Nice Price or Crack Pipe Baja Bug looks like it was ripped straight out of a high school parking lot circa 1980. Let’s find out if its price makes it ready for fast times. In regards to yesterday’s 1987 Toyota Supra with its surprising discovery of a GM LSX under the hood, some of you said that if you wanted a V8-powered grand touring coupe from the ‘80s you’d simply buy a damn Aston Martin V8 Volante. Well not really, but hey, 54% of you did give the Supra a Nice Price win which was damn nice of you all the same. It’s Friday and I think that means we’re all ready for a little fun. And what could be more fun than an old school Baja Bug? Just ask Raph. This 1970 Beetle has been Ba’d to the Ja, and looks to be a pretty tidy conversion too. You don’t see all that many Bajas anymore (unless you’re Raph) but they were once pretty common around where I grew up. The first one is generally attributed to Gary Emory, who was an assistant parts manager at a VW dealership in Newport Beach, California back in the late ‘60s. Emory was trying to scrape together enough money to build a Meyers Manx, but he couldn’t manage it seeing as he was an assistant parts manager at a VW dealership in Newport Beach, California. His alternative was to trade a motorcycle for a ’57 Bug and build his own “Dune Buggy.” That involved chopping off the nose and tail and having new fenders and a nose cap created by Valley Custom, the legendary Hot Rod shop in Burbank, CA. This is one of the multitude of Baja’s that followed in the ‘70s and ‘80s, and looks like it’s been transported directly from that era. In fact, I’m pretty sure that in high school I had a tee-shirt in that same color and pattern, probably with a pair of tiny feet on it. I wore it with my puka shell necklace and huaraches. Yeah, I was a poseur surfer dude back in the day. The seller of this Baja says that the car sports a dual port 1600, which is fed by a downdraft Weber. Of course, seeing as it’s a Baja Bug and the engine is just hanging out there like a monkey’s ischial callosity you probably already figured that out. There’s also a new battery under the back seat, new shocks in the front, and what are described as decent tires all around. In back there’s a stock IRS set up while the front has been cut and turned (the front torsion bars aren’t splined like in back so the mounts need to be cut out and re-welded in at a different angle) to affect the high rise stance. It looks like there’s a clean title on the car, and it’s a sunroof Bug, if you’re into that. Lastly, it appears to have one of those full-width, multi-mirror rear-views that were also all the rage when I was a kid. I love those guys. The price? $3,850. The seller says he needs the cash for a street legal dirt bike which is an interesting thing to say you need cash for. What’s your take on this Baja for that kind of dinero? Does $3,850 seem like a fair price for this throw back Bug? Or, is for that much, would you want something that doesn’t leave its engine in the elements? H/T to eddiebrannan for the hookup!